The Hunter Douglas Duette® Honeycomb Shade is one of the most popular and versatile horizontal window treatments on the market. The honeycomb design offers a clean and sophisticated look in the window while also providing a layer of insulation, improving the energy efficiency of your home. The Vertiglide™ vertical solution for sliding patio doors and large expanses of windows coordinates beautifully with any of the Hunter Douglas honeycomb offerings. Stunning Silhouette® shadings are made with vanes that float between two sheers to diffuse harsh sunlight. Tilting the vanes allows you to control light and privacy. There are no cords or tapes for an unobstructed view to the outside. Available in semi-sheer, semi-opaque, and opaque in variety of colors and textures. Luminette Privacy Sheers are an excellent complement for sliding glass doors and wide windows. 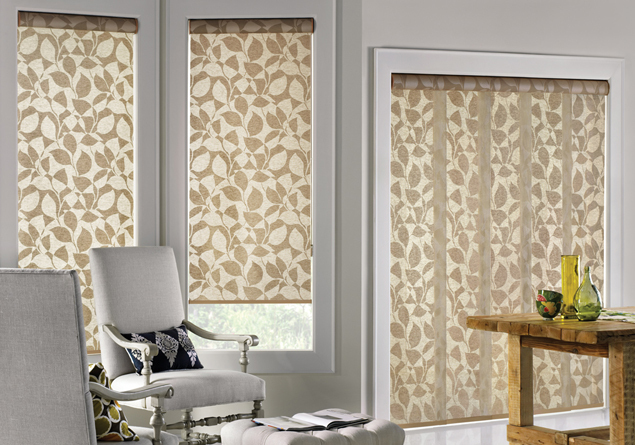 Vignette® Modern Roman Shades are an innovative take on the Roman shade. They are available in 4” and 6” traditional and tailored fold sizes, three opacity options and a wide variety of fabrics, colors and textures. The Luminette® line of privacy sheers offers a collection of complementary fabrics by pairing similarly styled, colored and textured fabrics, making it easy to mix and match with your Vignette shade. Designer Roller shades are a simple but stylish window covering available in hundreds of colors, patterns and fabric choices from sheer to opaque. Coordinating top treatments conceal the fabric roll for clean look. Skyline™ Gliding Panels offer a patented twist on panel track blinds. Fabric, colors and textures coordinate well with roller and screen shades. Window Covering Brand of the Year Goes to Hunter Douglas!